As the breadth and depth of information continues to expand on the internet to viewers, the process of curating content has become more important than ever before. Curating is a means to sort through the copious materials available to critically evaluate web resources in an effort to select and aggregate the best, most relevant sources that align to a dedicated topic/focus. reflect on the curating process itself. Internet Magazine Focus: Blended/Hybrid learning is an educational program that offers a mixture of content delivery through traditional face-to-face classroom instruction as well as through the use of technology using digital media within an online component. I am very interested in the use of mobiles (tablets, smartphones, mobile apps) within a blended learning K-8 educational setting. The portability, usability and intuitive interface of mobiles not only supports a blended learning environment but extends the reach of learning content. This technology has the greatest appeal to me because mobile learning is becoming prevalent throughout K-12 education institutions due to 1:1 and BYOD initiatives as well as it is becoming increasingly common for younger students to have access to mobile devices. The New Media Consortium (2013) states "at the end of 2012, the Daily Mail reported that 75% of ten-year-olds in the UK, for example, own a mobile device, and the global average is approaching 50%." (p. 17). Purpose: The K-8 school district that I am currently employed within is beginning to develop a long range plan to implement a 1:1 initiative. Once each student has a mobile device in the classroom, teachers will be offered a plethora of opportunities to introduce blending learning practices as well as incorporate mobiles into daily instruction. 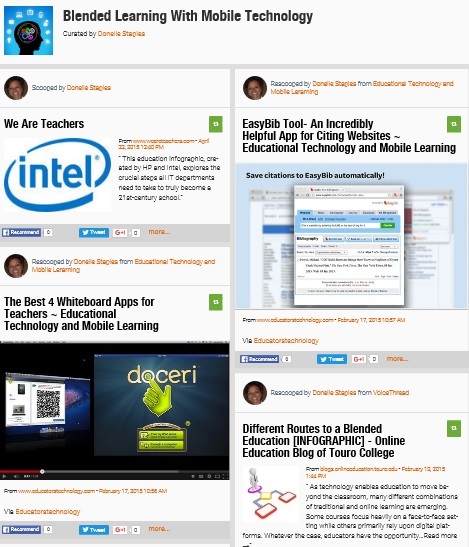 The Blended Learning with Mobile Techonlogies magazine has facilitated my search for reliable information and resources to assist in future decision-making and planning for the implementation of a 1:1 initiative and can also offer opportunities for professional development to staff by assisting them with building prior knowledge as it can support syncronous and asyncronous learning. Artifact Reflection: My Blended Learning with Mobile Techonlogies magazine was the most rewarding artifact that I have created with the E-Learning for Educators course. I wanted to learn best practices with beginning a blended learning environment and how to use mobiles to support such. In curating my first internet magazine I have acquired an artifact that can be build upon and useful in my professional career. In reflection of the curation process, I think I have realized that curation is synonymous with usefulness and focus. I found myself looking through a variety of sites, however the curation process kept me focused to choose artifacts that were aligned with my topic, useful by what the content offered to meet my objective, and accurate in information. 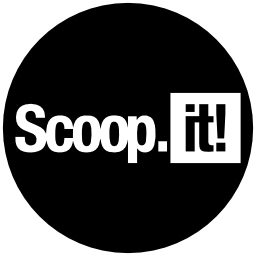 The Scoop.It tool offers versatility in use; building prior knowledge when teaching concepts, a resource portfolio and/or an online binder for articles of interest when investigating various solutions.